PHILADELPHIA – When Gerald A. Miller first saw the experimental results from the Thomas Jefferson National Accelerator Facility, he was pretty sure they couldn't be right. If they were, it meant that some long-held notions about the proton, a primary building block of atoms, were wrong. But in time, the findings proved to be right, and led physicists to the conclusion that protons aren't always spherically shaped, like a basketball. "Some physicists thought they did the experiment wrong," said Miller, a University of Washington physics professor. "Even I thought so initially. And then I remembered that it looked like something else I thought was wrong – our own conclusion in 1995." In fact, by 1996 he and two colleagues were ready to publish a paper theorizing the angles at which protons would bounce off electrons after collisions in a nuclear accelerator. The measurements would tell a lot about protons' internal electric and magnetic properties, and virtually everyone expected the two effects to cause the same kinds of collisions. But the 1996 paper described collisions that were quite different. Miller was sure he and his colleagues had gotten it wrong somehow – until he saw the results of the actual experimental work at Jefferson, a national laboratory in Newport News, Va. Researchers at Jefferson published their initial results in 2000 and updated their findings last year. What Miller discovered from those results is that a proton at rest can be shaped like a ball – the expected shape and the only one described in physics textbooks. Or it can be shaped like a peanut, like a rugby ball or even something similar to a bagel. He was able to use his model to predict the behavior of quarks, and he discovered that different effects of the quarks could change the proton's shape. The model showed that the highest-momentum quarks, those moving nearly at light speed inside the proton, produced the peanut shape. "The quarks are like prisoners walking around in a jail cell. They just are walking very fast, and when they come to a wall they have to turn around and we can see that, indirectly, and measure it," Miller said. If the quarks are moving more slowly, the surface indentations of the peanut shape fill in and the proton takes on a form something like a rugby ball, or a beehive. The slowest quarks produce the spherical shape that physicists generally expected to see. 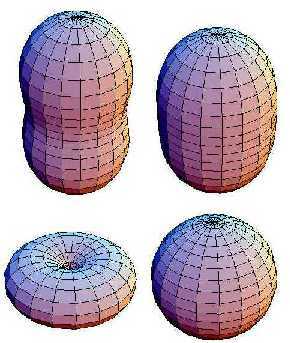 Another shape – a flattened round form like a bagel – is sort of a cousin to the peanut shape with the high-momentum quarks. In the peanut shape, the quarks spin in the same direction as the proton, while in the bagel shape they spin in the opposite direction as the proton. The variety of shapes is nearly limitless and depends on the speed of the quarks inside the proton and what direction they are spinning, said Miller, who presents his findings today during a news conference and an invited talk at the American Physical Society's April meeting in Philadelphia. The Jefferson results, he said, are a small piece of the puzzle for physicists who are trying to unify the four forces of nature – gravity, electromagnetic, strong and weak – into a "theory of everything" by which they can understand the form and function of all matter. Taking this step, Miller said, allows physicists to make better predictions so other experiments can get even closer to a unified theory, and it provides clues for how to devise those experiments. The first implication of the Jefferson findings, he said, is that "a bunch of textbooks will have to have some of their pages updated." Beyond that, he said, it isn't clear right now whether there will be practical implications. However, he tells the story of Michael Faraday, who presented findings in the 1830s on electromagnetic induction but was at a loss to explain the value of his findings. Yet today, the principles he developed are responsible for all the electric generators sending juice from power stations. "You just never know until you understand something where it might lead," Miller said.